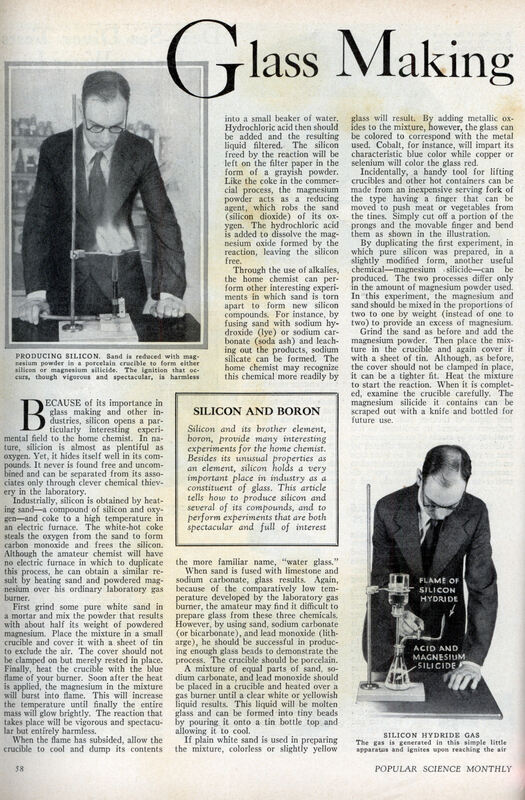 BECAUSE of its importance in glass making and other industries, silicon opens a particularly interesting experimental field to the home chemist. In nature, silicon is almost as plentiful as oxygen. Yet, it hides itself well in its compounds. It never is found free and uncom-bined and can be separated from its associates only through clever chemical thievery in the laboratory. Industrially, silicon is obtained by heating sandâ€”a compound of silicon and oxygenâ€”and coke to a high temperature in an electric furnace. The white-hot coke steals the oxygen from the sand to form carbon monoxide and frees the silicon. Although the amateur chemist will have no electric furnace in which to duplicate this process, he can obtain a similar result by heating sand and powdered magnesium over his ordinary laboratory gas burner. First grind some pure white sand in a mortar and mix the powder that results with about half its weight of powdered magnesium. Place the mixture in a small crucible and cover it with a sheet of tin to exclude the air. The cover should not be clamped on but merely rested in place. Finally, heat the crucible with the blue flame of your burner. Soon after the heat is applied, the magnesium in the mixture will burst into flame. This will increase the temperature until finally the entire mass will glow brightly. The reaction that takes place will be vigorous and spectacular but entirely harmless. When the flame has subsided, allow the crucible to cool and dump its contents into a small beaker of water. Hydrochloric acid then should be added and the resulting liquid filtered. The silicon freed by the reaction will be left on the filter paper in the form of a grayish powder. Like the coke in the commercial process, the magnesium powder acts as a reducing agent, which robs the sand (silicon dioxide) of its oxygen. The hydrochloric acid is added to dissolve the magnesium oxide formed by the reaction, leaving the silicon free. Through the use of alkalies, the home chemist can perform other interesting experiments in which sand is torn apart to form new silicon compounds. For instance, by fusing sand with sodium hydroxide (lye) or sodium carbonate (soda ash) and leaching out the products, sodium silicate can be formed. The home chemist may recognize this chemical more readily by the more familiar name, “water glass.” When sand is fused with limestone and sodium carbonate, glass results. Again, because of the comparatively low temperature developed by the laboratory gas burner, the amateur may find it difficult to prepare glass from these three chemicals. However, by using sand, sodium carbonate (or bicarbonate), and lead monoxide (litharge), he should be successful in producing enough glass beads to demonstrate the process. The crucible should be porcelain. A mixture of equal parts of sand, sodium carbonate, and lead monoxide should be placed in a crucible and heated over a gas burner until a clear white or yellowish liquid results. This liquid will be molten glass and can be formed into tiny beads by pouring it onto a tin bottle top and allowing it to cool. If plain white sand is used in preparing the mixture, colorless or slightly yellow glass will result. By adding metallic oxides to the mixture, however, the glass can be colored to correspond with the metal used. Cobalt, for instance, will impart its characteristic blue color while copper or selenium will color the glass red. Incidentally, a handy tool for lifting crucibles and other hot containers can be made from an inexpensive serving fork of the type having a finger that can be moved to push meat or vegetables from the tines. Simply cut off a portion of the prongs and the movable finger and bend them as shown in the illustration. By duplicating the first experiment, in which pure silicon was prepared, in a slightly modified form, another useful chemicalâ€”magnesium silicideâ€”can be produced. The two processes differ only in the amount of magnesium powder used. In this experiment, the magnesium and sand should be mixed in the proportions of two to one by weight (instead of one to two) to provide an excess of magnesium. Grind the sand as before and add the magnesium powder. Then place the mixture in the crucible and again cover it with a sheet of tin. Although, as before, the cover should not be clamped in place, it can be a tighter fit. Heat the mixture to start the reaction. When it is completed, examine the crucible carefully. The magnesium silicide it contains can be scraped out with a knife and bottled for future use. A combination of silicon and hydrogen, called silicon hydride, can be prepared by adding hydrochloric (muriatic) acid to a small quantity of the magnesium silicide you have made. The product, a mysterious gas, is particularly interesting because it ignites or explodes spontaneously as soon as it is released in the air. To demonstrate this harmless spontaneous reaction, the home chemist should arrange a simple generator consisting of a glass flask, a two-hole stopper to fit, some glass and rubber tubing, a funnel or reservoir made by cutting the bottom from a bottle, and a pinchcock. The apparatus should be arranged as shown so that water poured into the upper reservoir flows into the flask to displace the air. The glass tube leading from the reservoir should extend almost to the bottom of the flask. Place the magnesium silicide in the flask, replace the stopper, tighten the screw clamp over the rubber section of the outlet tube, and finally fill the system with water. Ten or fifteen cubic centimeters (about a half fluid ounce) of hydrochloric acid then should be added by pouring it into the reservoir. Because of its weight, it will sink to the bottom of the flask where it will soon come in contact with the magnesium silicide. In the reaction that follows, bubbles of silicon hydride gas will be given off. However, being prevented from escaping by the pinchcock, the gas will collect in the flask, gradually pushing the water and acid back into the reservoir. When a quantity of the gas has collected, loosen the screw clamp. As the gas reaches the outer atmosphere it will burst into flame and burn with a bright yellow light. Take particular notice of the smoke that is formed. It contains small particles of silicon dioxide or sand formed by the reaction. The property of silicon hydride to ignite spontaneously will be illustrated further when the apparatus is taken apart. As each small gas bubble trapped in the tubing and bottle comes in contact with the air it will explode with a harmless crackling and popping. Like many elements in the chemical family, silicon has a brother. It is called boron. Ordinary household borax and boracic (boric) acid both contain boron and it is with these two inexpensive and easily obtained substances that the home chemist can perform many interesting experiments. Boric acid is a weak acid and because of its mild antiseptic properties is widely used as an eye wash. When heated, solid boric acid froths as its water of crystallization is driven off, finally melting into a crystal glasslike substance. This glass is boron trioxide and is chemically akin to ordinary sand. Like sand, it will be reduced when ignited with powered magnesium, giving free boron. In demonstrating this reaction, however, it will be best to use commercial boron trioxide, since the homemade product may contain impurities. Boric-acid crystals can be made in the home laboratory from ordinary household borax. First dissolve a small quantity of borax in water. When tested with litmus, this solution will display an alkaline characteristic by turning red litmus blue. Then add just enough hydrochloric acid to redden a strip of blue litmus dipped in the liquid. This will convert the borax into boric acid. To obtain the boric acid in crystal form, heat the solution to concentrate it. The boric acid crystals which separate out from the liquid when it cools can be identified by the fact that they will feel greasy to the touch. Finally, dry the crystal by placing them on a sheet of blotting paper. By making up simple test papers, the amateur can test any solution for the presence of boric compounds. These test papers are made by immersing strips of blotting or other absorbent paper in a solution of turmeric in water and allowing them to dry. You can obtain powdered turmeric from grocery stores. When using the test paper, first add a few drops of hydrochloric acid to the solution to be tested. Then place two or three drops of the liquid on the paper and allow the strip to dry. This can be done by placing it on the sides of a hot flask of boiling water. If the strip, which originally is yellow, turns pink where the liquid was applied, boron is indicated. As a double check, place the pink portion of the paper in ammonia water. If the first test is correct, the spot will turn black. Since boron is an ingredient of many eye washes, hair lotions, and throat gargles, the experimenter can use the turmeric papers he has prepared to test for its presence. Another common compound of boron also is sold by druggists as a mouth wash or oral antiseptic. It is called sodium perborate and its cleansing properties are due to the fact that it gives off quantities of oxygen. This can be demonstrated by dissolving some of the powder in water and heating it, testing the gas by placing a small smoldering string close to the liquid. The glowing of the string will be evidence of the oxygen present. Because of its high oxygen content, sodium perborate also will bleach the color from cloth. The colored portion of wood match boxes can be completely bleached out in a few seconds with a solution of the chemical. By adding salts to a solution of borax, the home experimenter can produce various precipitates. Copper sulphate solution, for instance, added to borax solution, will form green copper borate. In a similar way, borates of nickel, iron, chromium, cobalt, magnesium, calcium, zinc, manganese, and aluminum can be made. AH, THE GOOD OLD DAYS; WHEN NOTHING WAS (seen as) DANGEROUS! 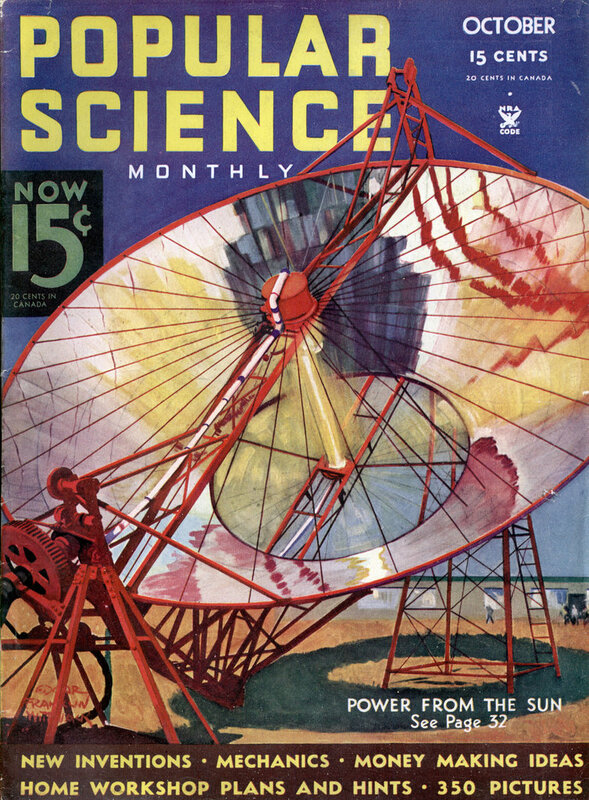 This was recently reprinted a few years back in Popsci.